Pangolin v3.2.3 Released, Download Now ! Speed up in fast mode when MySQL database later than 4.x. Speed up when dump Microsoft SQL Server 2005/2008 database. 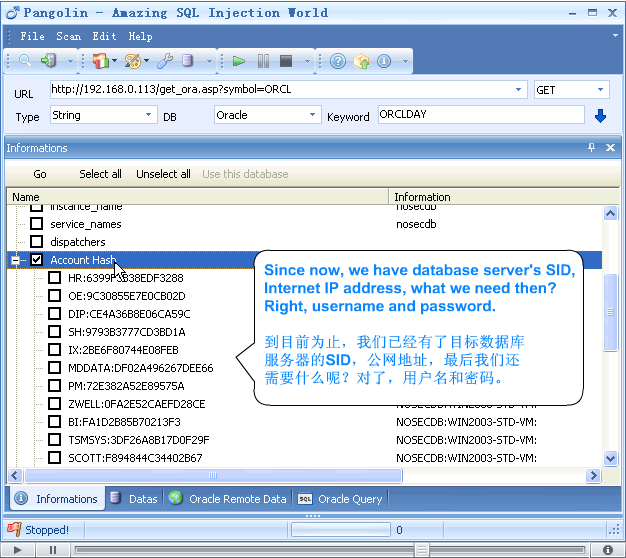 Enhance the injection ability of Informix database. Add feature to manual keywords selection. Fix the bug dump data incomplete in byte-by-byte mode. Enhance the ability injection detection, which will analyse the proper Cookie to test. Add command line parameter. Add languages option. Fix the collapse when long URL. Fix bug cannot pre-login on restricted sites. Fix the errors on the content management. Fix the abnormal of “Read Session”. Fix some memory leaking problem.